The next Ash Ave Comics’ Comic Book Club discussion group is Sunday, October 4th at the shop! 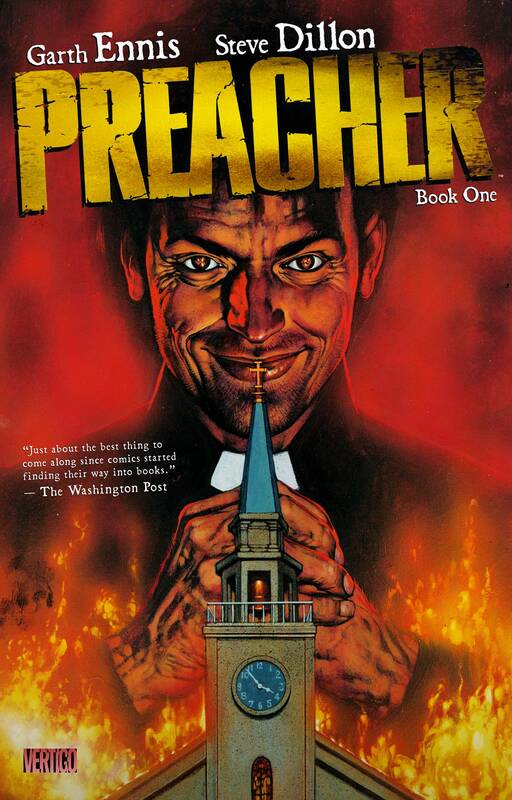 We’ll be gathering at our usual time of 6 PM to discuss one of the most acclaimed and controversial comics of the last 20 years, Garth Ennis and Steve Dillon’s Preacher volume 1. Coming up in November we’ll be reading the first volume of Image’s Low by Rick Remender and Greg Tocchini! And a reminder that our current Reading Club titles are 20% off of the listed price, and we encourage anyone interested in attending the reading group to prepay for the next monthly title a few weeks ahead of time. Check out the cover image and summary of our next title below. Here’s our schedule for the next two months, all reading groups meet at 6 PM at the shop. PREACHER #1-12-plus pinups from PREACHER #50 and #66-are collected in this new paperback that introduces Preacher Jesse Custer, Cassidy and Tulip. Disillusioned with his own beliefs, Custer begins a violent and riotous journey across the country in search of God, who has abandoned heaven.